How To Drown Your Drainfield! Kill the Bill? : What price environmental protection? October 22: Industries around the world are seeking new ways to make every drop of water count. Agriculture, which uses a high 70% of the world’s fresh water, is no different. Many factors threaten the future of farming (e.g., saline soils, shallow water tables, inefficient irrigation and poor drainage). To survive, the industry needs smart irrigation technologies that can save water, deliver it more efficiently, and realize significant monetary savings. The stark fact is that all of the food we eat requires water, in the right amount and at the right times. Agriculture is the industry with the biggest stakes and the biggest potential pay-off. It’s a market opportunity set for explosure growth. The dynamic investment landscape includes government agencies interested in stimulating innovation that addresses efficient water resource management. The US Agency for International Development and the Swedish government, for example, recently announced a $25 million grant program to increase access to clean water for farming. New perspectives, technologies and investments are needed. The smart irrigation technology market has the greatest potential for growth and addresses the biggest issue we face…food insecurity. The winners of the race will go to the farmers who apply the technology, the small, niche companies with breakthrough technologies and the investors who back them. If English is not your primary language? It's all connected! 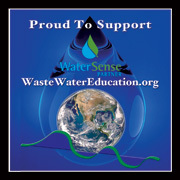 Water IS water, not waste!